At AlwaysFreshFish.com we purchase only the freshest Monkfish available. The fresh Monkfish we process are always from the North Atlantic waters of the United States. The Monkfish are delivered to our plant daily from local boats via refrigerated trucks. The meat from the Monkfish's tail section is firm, sweet and white colored. Cooked Monkfish has a firm texture almost like Lobster Tail meat, thus getting the name "Poor Man's Lobster." 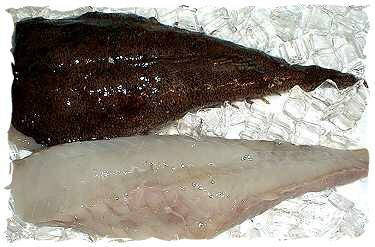 Monkfish fillets are always skinless and boneless. 1 lb. Fresh Monkfish + 4 lbs. Add. Selections = 5 lb. Total Order OK! Rinse Monkfish fillets under cold water and let drain. Heat Oil and Butter in skillet. Add Garlic and Onions and saute until soft. Place Monkfish in skillet and saute app. 2 minutes on each side. minutes. Slowly stir in remaining flour to thicken. Add Marsala Wine and Parsley. Let simmer one additional minute. Place Monkfish on serving dish and cover with the Marsala Sauce. For additional information on Fresh Monkfish, please e-mail AlwaysFreshFish.com.